Previously, on MinerBumping... Agent Zosius was helping himself to some wrecks in a carebear's mission. The carebear's main convo'ed him and misleadingly proclaimed ownership of all the wrecks. Zosius' Enyo was then attacked by the Dominix Navy Issue, which was unable to track him. Zosius offered to let the carebear go in exchange for a modest ransom. Gwowyn Cesaille had some interesting ideas about who started the fight. But the logs supported Zosius' version of events. Zosius only uses violence in self-defense. The carebear sealed his own fate. With his combat options exhausted, Gwowyn demanded that Zosius leave him alone. If successful, this strategy could revolutionize PvP engagements throughout EVE: Pick a fight, and if you start to lose, tell the other side to leave you alone. Just imagine the applications for nullsec warfare! 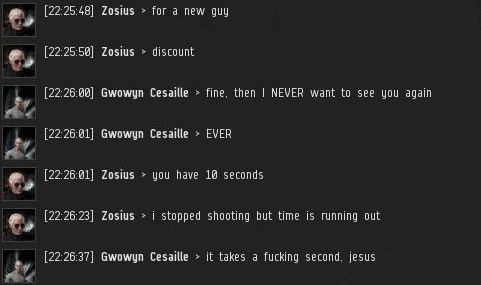 Despite Gwowyn's relentless violations of the Code, and despite the Dominix Navy Issue's value of approximately 600 million isk, Zosius was willing to let the ship go for less. Now it was time for Gwowyn to put aside his profanity and pick up a calculator so he could make a rational decision. Gwowyn still wasn't sure if his saying "leave me alone" in the convo window (a convo he started, incidentally) would act as a verbal warp core stabilizer. Perhaps he felt Zosius' use of a warp disruptor constituted "extraordinary real-life harassment"? Everyone who has ever ransomed a carebear knows that carebears love to lie about the extent of their in-game assets. 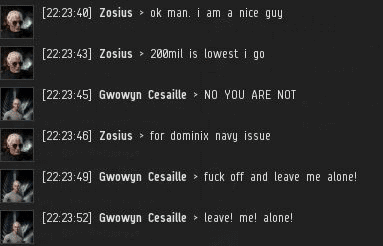 The pilot of a Dominix Navy Issue claimed he didn't have 200 million isk. At the same time, he claimed he was trying to sustain his account with a steady diet of PLEX, which cost somewhere around 700 million isk each. At last, Gwowyn admitted to having 100 million isk. According to the lying carebear, this was the total amount of isk he possessed. Not 150 million, not 101 million, but 100 million exactly. Even if this were true, it meant he was guilty of flying a ship he couldn't afford to lose. Another thing ransomers are familiar with is the way carebears delay in transferring isk. As someone who routinely gives other people money, I can say with total authority that it only takes a few seconds to make a transfer. 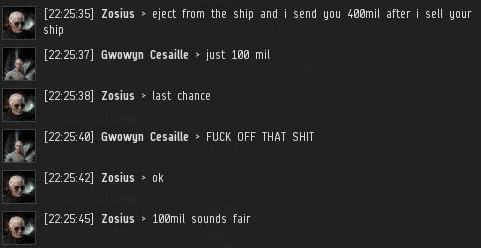 Gwowyn was stalling, even though he'd already agreed to hand over 100 million isk. 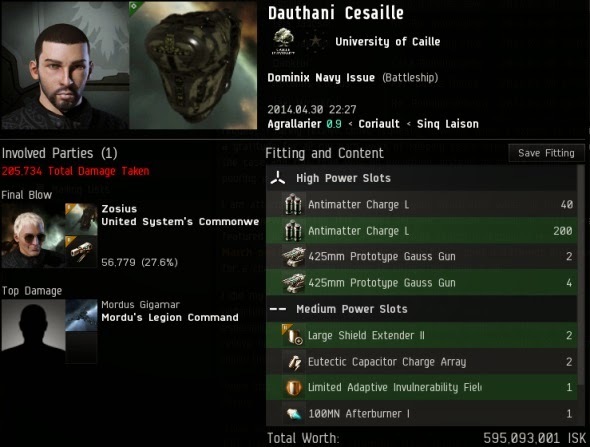 After nearly a minute, Gwowyn finally made the transfer of "all he had", 100 million isk. Now Agent Zosius had to make a decision: Would he destroy the ship anyway? ...He would. This, too, is something that people who ransom carebears will find familiar. Zosius finished off the Dominix Navy Issue which, unsurprisingly, was fail-fit. Not a moment's consideration had gone into how the ship might fare in PvP. Zosius was bitterly disappointed by the carebear's behavior. The lies, the entitlement, the impolite language, the violence... All things considered, Gwowyn got off easy. Zosius had barely any hope that Gwowyn would even offer a "gf". Gwowyn threatened to quit, violated the EULA, and abruptly terminated the convo. In other words, he behaved exactly the way you would expect a carebear to act without the guidance of the Code. Highsec is still home to many players like Gwowyn Cesaille. They say they just want to be left alone. For years, they have been left alone--and look where it got them. It's about time these people learned they have friends in highsec. A heartwarming story for the little ones as they snuggle down to sleep; the little ones of the New Order that is. Well done Zosius, flying the flag for all of us! Of course not, EWAR / EWAR drone interfacing are pvp skills. Why would a carebear train them? I'm more appalled by the mixed tank (on a faction BS no less) - this poor guy has obviously fallen off the "learning cliff" James mentioned a few posts back. Wouldnt you actually approach a learning cliff and look up and be like WTF? "Gwowyn Cesaille > I would beat you bloody in real life if I could find you"
A carebear reveals his true nature, and it ain't pretty. Thankfully, Zosius is not deterred by internet tough guys. Goodbye, 'Gwowyn', we are not going to miss you. We might point our fingers at you and giggle, but we won't miss you. Enjoy your new gaming experience in Star Trek Online, you will fit right in. Adiue, bon voyage, sayonara, get lost punk. Such a fail fit! He has absolutely no way of repairing hull damage! For shame. Will Ripard or anyone else use thia as an example of bullying? Time will tell. What is evident is the real life threats via CCP controlled software and hardware. If theres any consistency CCP will have to ban the person so he won't have to quit. "ok" "100 mil sounds fair" and then... "100 mil is not enough"
As a member of CODE let me just say that this WAS DISHONEST on Zosius' part. So the carebear was probably lying but are we not better than the carebears? We will never win the hearts and minds of the carebears if we keep being hypocrites. And then posting it on our site says to the EVE universe "LOOK AT US BE THE JACKASSES YOU SAY WE ARE!" The honest thing to do would have been to blow his ship away when he couldn't pay the 400 mil. or take the 100 mil and left the sad carebear alone for a day or two. The price was 400m. The carebear wouldn't pay it. So the Agent got what he could to help compensate him for this time. We all know carbears are pathological liars. They lie about about being hisec miners when they are. They lie about not having isk, then put multi-millions isk bounties on agent's heads. They lie about knowing that Eve is a PvP game and still undock in ships they don't expect to lose. Pay up, or blow up. Its the New Order way. Gorilla Vengaza failing to impersonate a member of CODE. The caps lock spam gives it away. Why? Everybody already knows that you're just a bunch of liars and hypocrites. No need in trying to keep up the charade. Btw: you just did the small crowd of pirates that honor ransoms a great service. And that is why you NEVER pay a dime to these douchebags. Just eat the loss of your ship and get back in the game. If carebears knew how to protect their ships and interact with other EVE players, they wouldn't be carebears. Once again though, we are treated to more evidence that for some reason, care bears seem to be the type of people unable to separate reality from video games. Slightly disappointed with the outcome. If Zosius agreed a 100mil should had stuck to his word. Blow him up and don't accept less than 400mil or take the 100mil and leave. Yes, the careber may be lying, but couldn't be proved at that point. Zosius clearly lied and failed to follow its word. And I believe keeping your word is the only thing can keep a human being respectable, even if your actions aren't supported by a carebear (piracy). Always keep true to your word. Is there any reason, Why the guy who opened the convo is not the guy who lost the dominix? I mean they are likely to belong to one person, because of their names, But can you tell me why those are two differnt characters?